Update August 10, 2017: Blizzard released Knights of the Frozen Throne earlier than planned in the US. If you live there, you can play it now. We don’t know whether this means the same will happen in other regions or not, but only the US is live at the time of writing. 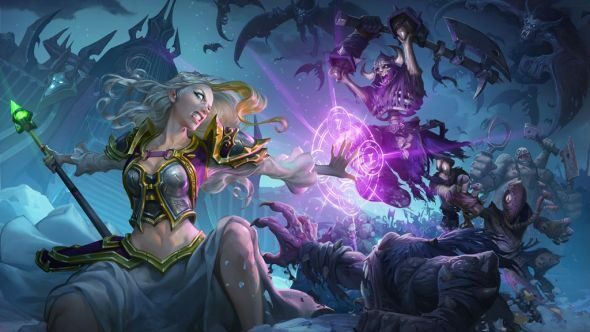 Here are all the Knights of the Frozen Throne cards. For now, check out the release times for your region below. Original Story August 9, 2017: Blizzard have released the launch times for Hearthstone’s Knights of the Frozen Throne expansion, which goes live on August 10. It will be rolled out by region, with the Americas first, Asia second, and Europe third. The expansion also features some new mission content. The first part, Prologue and Lower Citadel, will release with the expansion at the times stated above. The other two missions will be released one per week. If you beat the Lich King you unlock Arthas, a new Paladin.